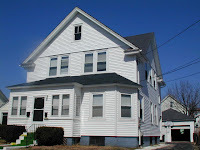 Two Family Cranston RI REDUCED!!!! This is it! Your chance to own a two family in a great neighborhood and get help with your mortgage. See the Virtual tour below. This house has been drastically reduced for a quick sale. This is a bank owned home and will be selling AS IS. Mostly needs updating. You will need a prequalification letter to make an offer, so get that first then call me. Don't wait too long. Follow this link to see the tour. Is there a Silver Lining in all the latest Foreclosures and Doom and gloom in the Real Estate Market? Maybe...Have you heard about the most recent possible help you, as a delinquent homeowner, may have? Here is a synopsis, taken from Bloomberg News, highlighting the general conditions needed to qualify. Under the proposal, mortgage servicers will work with borrowers to reduce monthly payments to 38 percent of their gross income, a threshold of affordability, by lowering the principal, reducing interest rates and extending the length of the loan term. The plan doesn't include money from the Treasury's $700 billion bank rescue and isn't mandatory for companies that received federal aid. Homeowners that qualify will receive notices about the program. Their loan modifications won't become final until they have made three consecutive payments, and there is no limit to the number of times a loan can be modified. The new payment will include all of the borrower's monthly housing costs, such as taxes and condominium payments. Fannie and Freddie are paying mortgage servicers $800 to process each modification, which isn't available for investment or vacation properties. Fannie and Freddie will absorb the losses on loans or mortgage securities they own while investors in mortgage bonds guaranteed by the government-run corporations will bear a brunt of the losses on that debt. So, if you qualify, you will receive a notice. Refinancing your home to 38% of your income will help you make those monthly payments, stay in your home and breathe a little easier! Basically, this percentage is what it "should" have been in the first place. Maybe the Holidays won't be so bad, after all! Today is November 4, 2008 and it is Election Day here in the United States of America. As many have said, it is historical for many reasons, no matter who is the President elect by tomorrow. I voted this morning at Saint Mary's School in Warwick Neck and the turn out was not as large as I had anticipated. One of the volunteers did say that there was a large turn out approximately an hour before I arrived. I am not one for counting Electoral votes as I do not think they accurately represent the Vote of the People! To me, the Vote of the People should be the ONLY vote there is in any election. However, this is the way it is and we need to get out their and make our voices heard in sheer numbers. My opinion is that many Americans have forgotten what our forefathers had originally intended when they wrote the Constitution. Especially the first amendment to the Constitution which is the Bill of Rights. I would like my readers to take a moment and read each one, then stop and think about each one. How many of these are still the same in our current lives?Today is an important date in our history, not just because we have our first female vice president candidate and our first black candidate, but because our freedoms (Rights) have been usurped. The economy both in Federal and State governments has been grossly mishandled. We have been outright lied to and nothing can be done about it. Our rights to privacy are gone. The World hates us! The list is enormous and I do not have the time to list all the current problems we as a country are facing. We should all be rioting in the streets, yet we are not. Today is the day to be heard. If you do not vote today, you will have no recourse. Make this the day, we as Americans, stand up and be counted. Take back our country. Our freedoms. Our Rights!